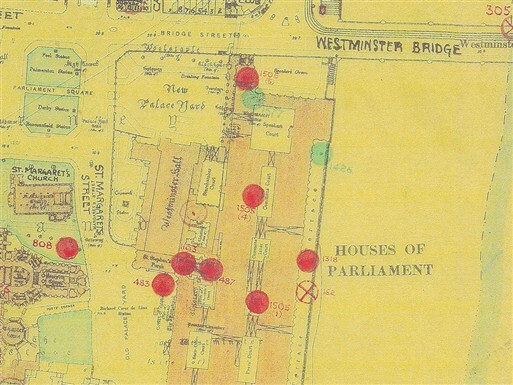 The Houses of Parliament and the immediate area around Westminster Abbey first suffered air raid damage on 11 September 1940. An anti-aircraft shell fell in Old Palace Yard, blowing out several windows in the Abbey and causing minor damage to its Henry VII Lady Chapel. 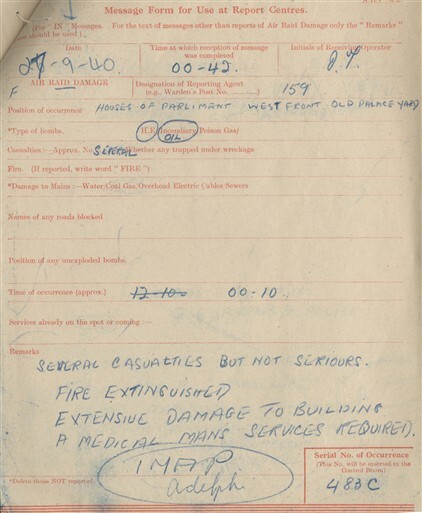 Two weeks later, at 12.10am, 27 September, City of Westminster ARP message forms record that Old Palace Yard was hit again - this time much closer to Parliament - by a high explosive bomb and by several incendiaries (including an oil-incendiary bomb). Three casualties were reported. 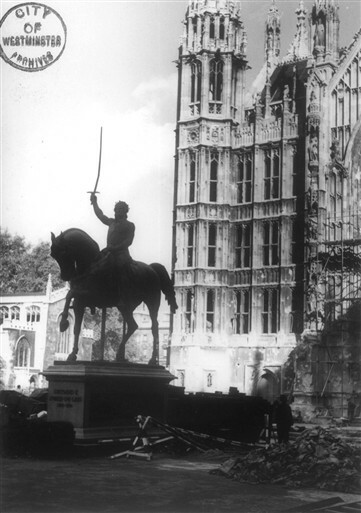 The western frontage of the Houses of Parliament - including the public entrance situated on Abingdon Street and the southern wall of St Stephen’s Porch - was badly damaged. The famous bronze statue of Richard the Lionheart was hit by the blast: the tip of the King’s sword was bent forward. A crater was left near the front of the building, doors were broken and ceilings brought down. Telephone lines were cut and most of the windows in the House of Lords were shattered. More damage was also caused to the Henry VII Lady Chapel, Westminster Abbey. Masonry and windows were blown out and a small hole perforated the Chapel wall. Local water mains were damaged and overhead electric cables brought down. 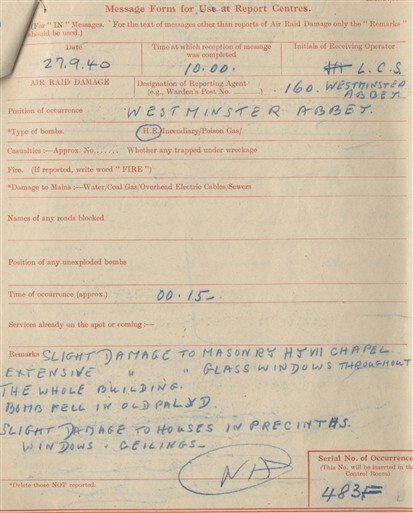 The ARP reported damage to local houses and minor injuries; several members of the Home Guard stationed in nearby Westminster Hall were knocked over by blast. Initial damage to coal gas mains caused fire to erupt but it was quickly extinguished.